Selkie are making waves (pun intended) on the folk scene, establishing a loyal fan base due to their infectious, groove laden tunes and songs from Ireland, Scotland, England and Eastern Europe. They play an exciting fusion of World Roots Music, expertly uniting contemporary grooves with a solid understanding of traditional music, creating fresh interpretations which are defiantly modern. Selkie interweave lively Irish jigs and reels, Bulgarian horos, Swedish tunes, spine-tingling slow airs and powerfully expressive songs, interspersed with humour and sheer foot tapping energy. The result is a colourful mesh of dynamic musical dexterity guaranteed to keep you ensnared from the first to the last note! Ramona performs professionally and is well respected as both a singer and multi-instrumentalist. She has appeared at many festivals and prestigious venues including: The Mean Fiddler; Weavers; The Mick Jagger Centre; The Winter Gardens; Trinity Theatre; Marlowe Theatre and Gulbenkian Theatre. She has toured across Europe and beyond including: France; Belgium; Switzerland; Sweden; Finland; Cyprus; Bulgaria and around New Zealand, picking up musical inspiration from her travels, alongside the Celtic and Eastern European influences stemming from her mixed Irish and Latvian family roots. 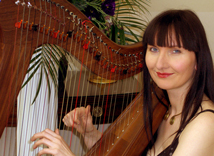 Constantly in demand and gigging in her own bands, as well as ‘guesting’ in numerous other bands, Ramona plays fiddle, whistles, mandolin and also branches out into solo work as a harpist. A dynamic singer she draws the audience into each song, retelling the lyrics with enchanting vocals and harmonies. She has worked on many varied recording and performance projects: including music for dance performances at the O2; supporting Suzanne Vega; performing gigs for Bob Geldoff and creating an arrangement of a Laurie Anderson song which she performed live to a special audience with Laurie Anderson and Brian Eno. In addition to all of this Ramona teaches Celtic harp, fiddle and whistles, works with storytellers and sometimes delivers workshops at festivals. Chris has amassed a colourful Irish musical history. He cut his teeth on the Irish circuit in London in the 70’s and since then has become something of a household name in the Kentish folk scene. He has toured with concertina maestro Noel Hill and top traditional singer Niamh Parsons. He has played regularly with Co. Clare fiddler master and teacher Brendan Mulkere and the traditional group Slip Jigolos. He has also worked regularly with members of Alias Ron Kavana, the Popes, Four Men & a Dog and Sin E, as well as various members of the casts of River dance and Lord of the Dance. Chris’ guitar style is both rhythmic and driving. His playing encompasses elements of folk, jazz, country, swing and blues. Despite never having any formal training in guitar, he has been lucky to receive tips and encouragement from some of the great guitar players associated with Irish traditional music; Arty McGlynn, Stephen Cooney and John Doyle. Also an accomplished Irish concertina player, he has been passionate about this humble little instrument for many years. He has taken it to various parts of Europe (incl. Ireland) on a number of occasions and runs workshops at festivals and events. An excellent singer in the Irish ‘Sean Nos’ style as well as contemporary, American and Blues, Chris’ vocals make a deep impression with their richness, depth and range. He is the holder of 2 All Ireland titles from the Fleadh Nua. He has made TV and radio performances, even appearing as the concertina player in the feature film Ladies in Lavender starring Judi Dench & Maggie Smith. Dan’s dynamic bass playing underpins Selkie’s unique sound. From Punk to Prog, Dan has played in many bands over the years. His eclectic tastes have taken him on a musical journey encompassing Rock, Metal, Psychedelic, Ambient and Experimental music forms, alongside a deep rooted passion for lyrics and song writing. Studying music theory and performance skills at M.I. in London crystallized his transition from guitar to bass. His broad musical background combined with great sensitivity and dexterity brings in a new dimension and a fresh inventive approach, pushing at the boundaries of traditional music to experiment with different grooves. People often comment on Dan’s obvious enjoyment of the music and performing, which comes out in his happy, energetic, stage presence. Whether at a festival or a small venue - he just can’t stand still whilst he’s playing! Why should I choose Selkie for my event? Our sound is very versatile and suits events ranging from concerts to parties and festivals. Both Ramona and Chris are strong vocalists and accomplished instrumentalists. Joined by Dan on rhythmic bass, Selkie have a very full sound - but being a trio gives us more flexibility than a larger band when it comes to issues of space, cost and time required setting up and packing down. We can also tailor our volume to suit your event. Why are you called ‘Selkie’? The name Selkie comes from the legend of ‘the Seal-People: who can shed their seal skins and appear as humans on land.’ We chose it as a band name because it has links to many rich, colourful, folk-lore traditions from Ireland; Scotland; Shetland; Scandinavia and beyond. Similarly our music moves across cultures and from traditional to contemporary. What if people aren’t into folk music? The guests invited range from children and teenagers through to elderly relatives, will the music appeal to them? We have a lot of variety in the set, including upbeat, foot-tapping instrumentals and songs flavoured with a mixture of musical styles. We have plenty of experience performing for all kinds of events and audiences and enjoy entertaining and creating a great atmosphere, the emphasis is on: FUN, ‘feel good’ music, great for parties and celebrations. How many of you are in the band and what instruments do you play? We will work to the client’s schedule within reason. Normally 2 X 60 min sets or 3 X 40 min sets. Usually we allow 1 hour to set up. Sometimes we arrive earlier if we are traveling a long distance or if there are special requirements. Yes we have a compact but powerful HK Lucas PA system which is great for up to small halls. Only if specified when booking. Do you play with backing tracks? No, the show is totally live. We can play CDs between sets if background music is required. Do you provide a disco? We do not provide a disco but can play CDs between sets at no extra charge. Do you require a stage and if so how big? Selkie can play on or off stage but do require a minimum playing area of approximately 10ft x 6ft. We use a very compact yet powerful HK LUCAS PA system which saves a lot of space. Yes, but we require some coverage for ourselves and our equipment in case of showers – even a gazebo will suffice as shelter from both rain and sun. This then doubles as a focal point to the stage area giving a festival feel! We just require suitable electric cables (in line with current legislation) running to the stage area, so it’s a good idea to arrange this with the venue in advance. Do you do barn dances? Selkie are a performance based band, however, Selkie can be made into a barndance/ceilidh band with a caller and extra musicians if required and are available for enquiries. Hot meal or buffet (especially on long journeys). 1 vegetarian option please (fish / seafood is ok). Do you have PAT testing? Yes, our equipment is annually PAT Tested and certificated.